That (or something similar) has been requested before here. Shouldn't increase the complexity of the extension too much, so I guess I could add it. But don't expect this to happen soon. Option to link all root folders for page, link, and image types. Having to set each one to have the same folders is annoying. Duplicate filename error checking and resolution (ask, overwrite, ignore, etc). Tighten folder list so there's not as much space between folder names. Option to lose the "Save Here" line and just click the folder name to save there. + autoincrement name. Useful things. Eep² wrote: 1. Option to link all root folders for page, link, and image types. Having to set each one to have the same folders is annoying. 2. Duplicate filename error checking and resolution (ask, overwrite, ignore, etc). 3. Tighten folder list so there's not as much space between folder names. 4. Option to lose the "Save Here" line and just click the folder name to save there. 1. While I understand your point, setting the folders is still kind of a one time thing. And I don't know how many people use the exact same root folders for each type. Yet another checkbox to link them might be an overkill. 2. If I have the time and the energy to rewrite this thing in the future then I might consider this. Maybe. 3. I couldn't figure out how to make the gap between menu items smaller. Theming and css isn't really my thing. Below is some css that makes the items smaller but has no effect on the gap. If you want to try it, add it to your userChrome.css. If someone knows how to change the gap between menuitems, let me know. Thanks for suggestions, Eep². I don't want to be seen as shooting down your ideas, it's just that I want keep things simple and not add an option for every possible feature. Not saying that the current options would be the simplest possible but still. http://downloadstatusbar.mozdev.org/emmenu/ and http://james.istop.com/OptionsMenu/ are 2 extensions that have tighter menus; maybe you can check their source code for how they do it. Yes, of course you are right. But then the first request from user X would be: "Can we have separate root folders for each type, pleeease". It's a balancing act. Thanks for those links, I'll check them out. I looked through the extensions you linked to. Afaict they don't use any special styling in their menus, so their menus look to me just the same as Save File to's menus. Or if I'm missing something obvious, take a couple screenshots that shows the problem and some explanation what you are after. Perhaps the submenu triangle (">") function(?) causes the extra spacing on each line? They look different because Save File to uses normal menuitem elements and EM menu does not. If you compare Save File to's menu to tools menu itself, you can see that they look the same. EM menu's custom menuitems leads to unpredictable behavior. You get smaller gap, but I get just the opposite (linux, ff2, default theme). No exactly sure why. Repeat: If someone knows how to change the gap between normal menuitems, let me know. Mainly Firefox 3.5 compatibility release. Support for private browsing. A couple new translations. .:warmth:. | Betatesting a life! I agree it needs to be simple, but I don't believe it currently is. The main problem is the idea of a root folder. You simply recreate the basic problem of the standard Firefox Save Page As process, where you have to navigate through folders and subfolders, but you do it in a visually more clumsy and unmanageable way. Sorry. The way that subfolders open in a huge pane whether you want them or not, with no option to disable that action, is visually distracting and slow. If you keep using the app, you keep creating more subfolders for the files for each page you save, and the problem gets steadily worse. Forget 'root' and 'recent', just let people add folders. Give them the option to have subfolders open if they want, as a global setting, but the default should be that folders in the submenu don't open up subfolders. Sorry to be critical, but this is really a useful addon which, currently, is being almost completely ruined by one completely unnecessary complication. This is already exist, but without corresponding option, isn't it? In my case files are renamed to file(2).ext, file(3).ext well. All feedback is appreciated, including critical. If you don't like submenus, have you checked out other similar extensions: viewtopic.php?p=3586655#p3586655. An option to not to use subfolders is coming, and you can already disable recent folders. The speed at which the submenus open, is mainly dependent on the speed of your filesystem and the size of a folder. Plus, the whole subject of speed subjective anyway. All I can say, that it's fast enough for me. Having 'recent folders' goes some way to reducing the nuisance, but as someone has pointed out, listing them in the submenu below the root folders defeats most of the purpose, as there's no way to slide the pointer to the recent folders without triggering the visual mess and delay of the root folders. You have noticed the Show recent folders above root folders option, right. But in general, the extension is what it is. Some minor changes are coming, but if you find the menus confusing to use as they are now, I think you need to look for simpler alternatives. 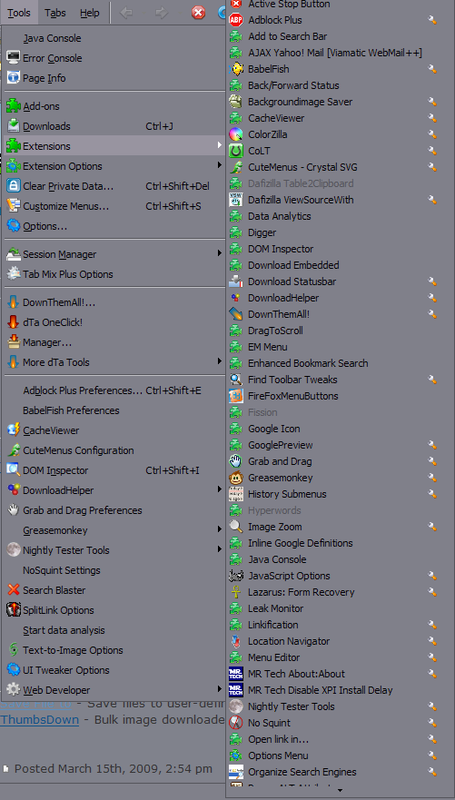 The whole submenu thing is what this extensions is about. Yes, the extension auto-renames like w0mbat said, but I think warmth wanted "macros". Something like this: example.jpg + $filename-$year-$month-$day.$extension => example-2009-05-20.jpg. When requested earlier, I said no. Now, maybe. Minor status update. Life afk is keeping me busy. But new version with some of the requested features is coming. I just can't give any timetable.